One of the things that I miss from home is a clothes dryer. The other day I was reminiscing about when we lived in North Carolina, and I would do laundry just once a week. I would do three loads, one after the other. And then nothing for the rest of the week! Here it seems that I do laundry almost every day – one load per day. You see, all of the washing machines here seem to take at least an hour to run a cycle, so I have to load the machine first thing in the morning if I want to have it out on the line before I go to work. 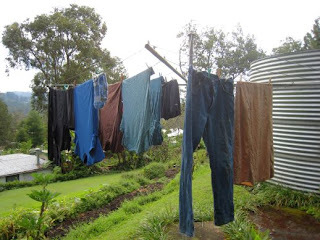 And it often rains in the afternoons, so you pretty much have to have your clothes out on the line by 8am if you want them to be dry when you come home for lunch. It is possible to buy a dryer here, but they are expensive and also very expensive to operate, because electricity is not cheap here. Most of the time I don’t mind hanging my things on the line to dry, but they do seem to get stretched out and faded a lot quicker. And my towels are not nearly as soft. Someone advised us to bring lots of extra underwear and socks with us – enough for four years. I’m so glad that they did, after seeing just how saggy everything can get after just a few months! Another thing that I have discovered in the world of laundry is Napisan. It’s a product used to sanitize and clean cloth diapers. I don’t have to worry about diapers yet (or “nappies”, as the Aussies call them), but I have found that it’s about the only thing that will get the grease out of Brian’s coveralls when he comes home after a day of rolling around in grease puddles or whatever it is that he does to get so dirty. I usually soak them overnight in Napisan and then wash them, and they come out nice and clean (and then all the other mechanics make fun of him because his clothes are so bright). Laundry is just one example of how just living takes more time here. It’s amazing how the little extra things around the house that you didn’t have to do back home really add up. Cooking, cleaning, laundry… it all just takes a little more effort than it used to. 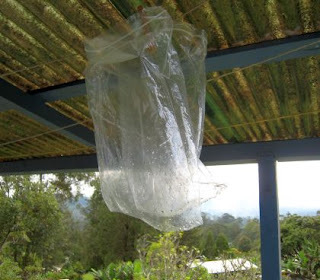 Yes, I now rinse out and save my Ziplock bags! You mean everyone doesn't rinse and reuse Ziploc bags? !